Just over the Minnesota-Wisonson border in the sleepy town of Baldwin, Wisconsin, lies one gem of a thrift. Divided into two separate storefronts across the street from each other, one for clothing and accessories and the other for furniture, home decor and the like, “Treasures From the Heart,” is definitely worth the drive. ♥ Linens: Holy smokes…where to start? Well for one, this place has vintage doilies coming out of its ears. And the prices on all the soft goods are great. Like $1 doilies, $2-5 for mint vintage tablecloths, $4 for sets of linen napkin/place mats, $5 for aprons, great. ♥ Vintage patterns: For the readers who’ve emailed me regarding what thrifts are best for sourcing vintage clothing patterns, I feel obligated to tell you this thrift has a slew. This is the pack that first caught my eye, but once I started digging, I found a ton more, including circle skirts, wedding dresses, etc., etc. 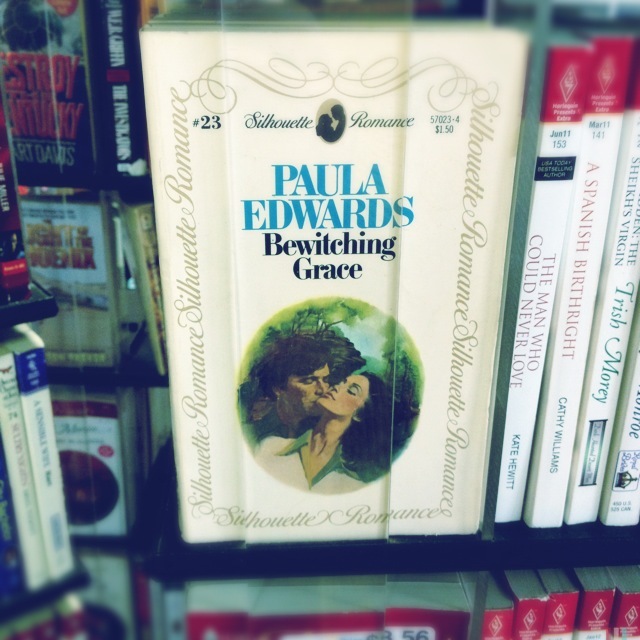 ♥ Romance novels: No seriously! If retro rom-drams float your boat, this store has racks and racks and racks of paperbacks. 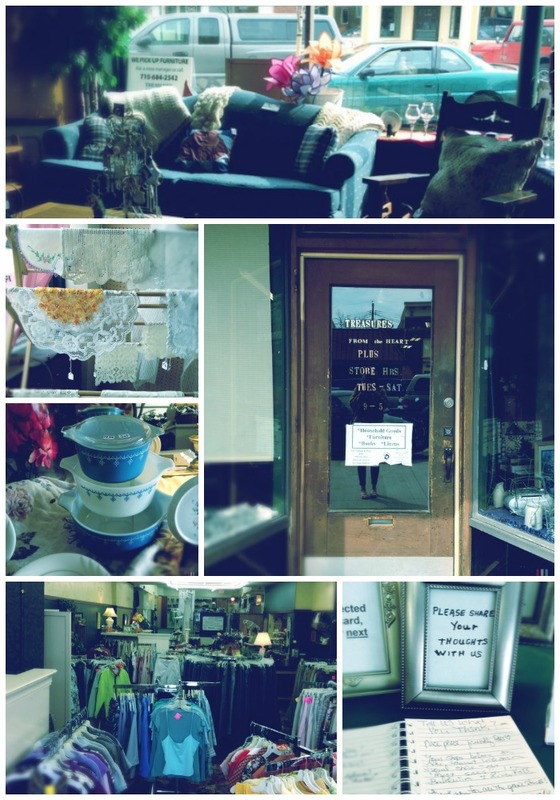 ♥ Vintage clothes: While the clothing store does have a dedicated vintage section, it’s pretty slim pickin’s. Where does money raised at this store go? To support ADORAY Home Health and Hospice, an organization devoted to providing comfort at home to the acutely, chronically or terminally ill.
Are they on Facebook? Oh yeah. Do they accept donations? Yep, and if you’re in the area, they’ll even schedule a pick-up. Pro tip: Start a punch card! For every $100 you spend, you’ll get $10 back in in-store credit. Tune in tomorrow to see what I found on my recent visit to this thrift! This entry was posted in Store Reviews and tagged store review, thrift-store review, thrift-store shopping, thrifting, vintage linens, wisconsin thrift by highplainsthrifter. Bookmark the permalink.